Operating at 1-bit/2.8224MHz, Grimm Audio's high-end AD1 A-D converter is designed for mastering analogue sources to SACD. Technical Editor Hugh Robjohns replies: The short answer to the last part of the question is that the quality is improved because, while the bit rate might be much lower, the sample rate is vastly higher: 2.8224MHz instead of 44.1kHz. The argument in favour of the 'Direct Steam Digital' (DSD) approach which lies at the heart of the SACD format is that it completely avoids all the digital filtering stages inherent in modern linear PCM systems — the conventional 16-bit/44.1kHz or 24-bit/96kHz format, or, indeed, whatever other combination of numbers you care to come up with! It is argued that the steep slopes necessary in these digital filters have an audible damaging effect on the signal quality, and by avoiding the filters, you can avoid the damage and thus remove the 'digital sound' that so many claim to recognise and dislike. However, very recent advances in digital filtering — specifically a filter technique called 'apodizing' — have been demonstrated to remove the time-smearing and ringing of conventional brick-wall digital filters, so this argument for DSD may become irrelevant. The majority of modern A-D converters actually sample the analogue signal at a rate considerably higher than the wanted sample rate — 128 times is a common multiple — but typically with only a small handful of bits. When sampling an audio signal at these high rates it doesn't change much between samples, and all that is needed is to identify whether the signal gets bigger or smaller from one sample to the next. Some seriously clever signal processing is then applied to trade off the combination of very high sample rate and low resolution to a much lower sample rate with very high resolution. This kind of A-D converter is generally known as a delta-sigma converter, and you'll frequently see references to '128 times oversampling delta-sigma converters' in product specifications. The reverse process is commonly used in D-A converters, where the digital signal is oversampled to a very high rate, with only a few bits, which is then converted back to analogue. 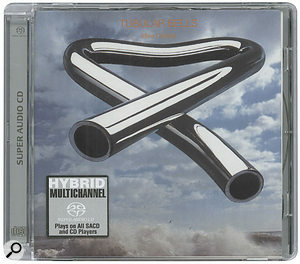 The SACD reissue of Mike Oldfield's Tubular Bells features stereo DSD, 5.1 surround DSD and standard CD versions of the album on one disc.Delta-sigma converters have several technical and financial advantages over the more complex and expensive multi-bit converters that used to be the mainstay of converter technology a decade ago. However, the typical A-D stage involves a 'decimation' process (essentially a lot of digital filtering) to generate the PCM output, and the D-A process involves oversampling (more digital filtering) to translate the data the other way. The DSD approach simply omits these decimation and oversampling stages, choosing to record the raw delta-sigma data instead. Hence the system records a single bit of data for each sample — a simple 1 or 0 (meaning each sample was bigger or smaller than the previous one) — but at 64 times the standard sampling rate of 44.1kHz (2.8224MHz). It sounds a wonderfully elegant approach and a lot of people swear by the sound quality it delivers, but as with all things digital, it's actually a lot more complex and compromised than it first appears. For a start, it is not practical to perform any meaningful signal processing on a single-bit data stream, so the DSD signal has to be converted to a 4- or 5-bit signal for most signal processing, and that essentially involves the same decimation and oversampling processes that the scheme was trying to avoid in the first place! Secondly, I don't know of any DSD converters that actually generate a single-bit output directly. Most seem to generate a few bits with conventional delta-sigma stages, and then convert that to the required DSD output. Next is the issue of noise: DSD claims a bandwidth in excess of 100kHz and a huge dynamic range in the audible band, but the fact is that there is inherently an enormous amount of ultrasonic noise (created by the noise-shaping technique used to achieve a respectable dynamic range in the audible part of the band). This can affect amplifiers and cause intermodulation problems in a largely unpredictable way. There are three big advantages to DSD, but none is primarily audio-related. The first is that it is an entirely new and heavily patented system, which should generate significant royalties for Sony and Philips to replace the now-defunct royalties from the original Compact Disc technology. The second is that very sophisticated copyright management features have been built into the SACD system to secure intellectual property in a way that appeals to the music software corporations. And finally, D-A conversion of a DSD signal is incredibly simple and cheap, which enables multi-channel hi-fi products to be made extremely cost-effectively. The equivalent multi-bit converters used in conventional linear digital systems are far more costly for the same perceived level of sound quality. Having said all that, the general consensus seems to be that when auditioned on good monitoring equipment, the SACD format sounds very good — certainly better than 16-bit/44.1kHz CDs. There seems to be less assured feedback about the comparison with 24-bit/96kHz linear PCM systems (which have a similar overall data rate) and many prefer the linear approach. But the fact that a lot of mastering houses and equipment manufacturers are supporting SACD at the same time as high-resolution linear PCM means that the debate will rumble on for quite a while yet.